With the option of custom framing, the sky is the limit and there is no singular answer. I often talk with my clients and ask about their personal styles or where i’ll ask where the piece might hang to get a sense of what to offer. 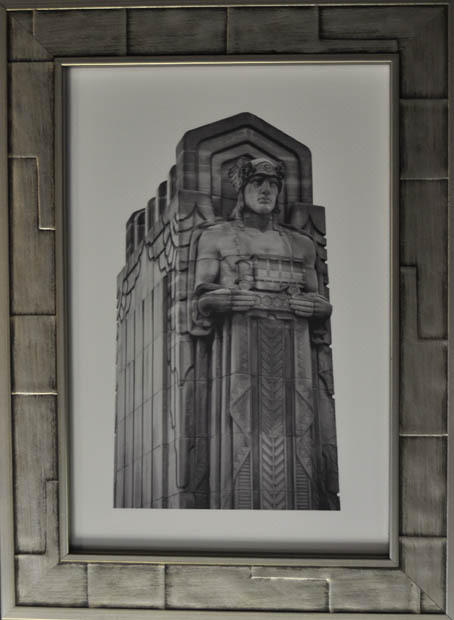 Pictured below and to the right are 4 of the same photographs of the Guardians of Transportation Bridge in Cleveland, OH (Courtesy of Christina Sadowski Photography). You can see there are plenty of options based on personal tastes. These are only a few of the many options the Pop Shop can offer: from no matting up to triple matting; simple metal frames to bold decorative frames, and different glass treatments. Every option is customized and personalized to the clients needs and likes. We will gladly walk you through every step of the process and find the best solutions for your pieces. This piece, Image 1, is framed in a traditional white frame. The frame has a slight decorative stripe on the interior that also bears a slight worn or weathered edging. 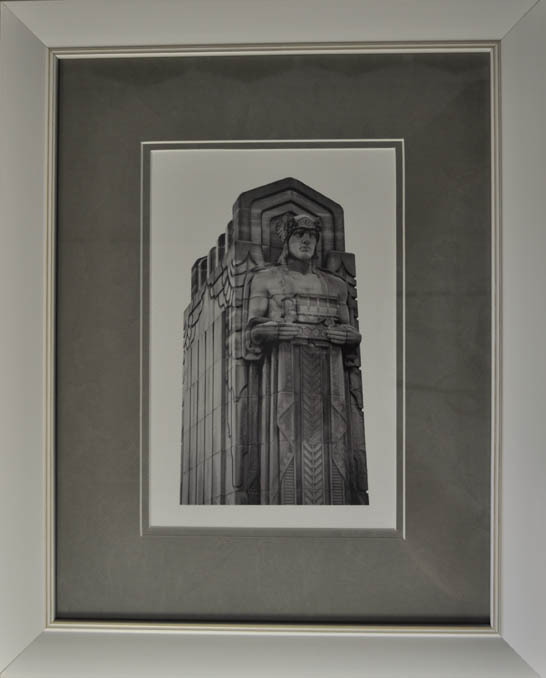 We double matted the image with a printed textured mat. The mat is grey in color with a stone like texture printed on it. We double the matting to add the beautiful white pinstripe that adds contrast to the grey mats. This is a simple way to add physical depth and additional sharpness to the image. The glass we used is regular/premium glass. Premium glass presents a crisp image and is the most commonly used glass in custom and ready made frames. 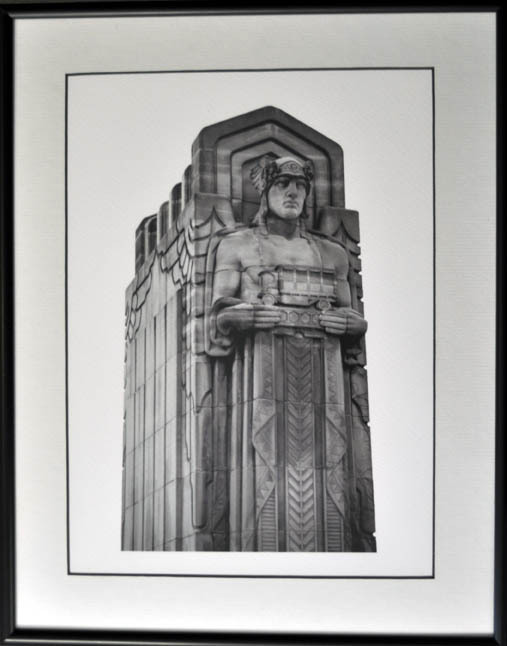 This piece, Image 2, is triple matted. We used 2 shades of grey bisected by a thin black mat. This gives physical depth while accenting the grays within the photograph. We varied the width of the middle mag (1/8 inch) and the bottom mat (1/4 inch) to allow for a pleasing esthetic look. We also used a contemporary black wooden frame with a steel colored inlay to emphasize the industrial look of the photograph. We used regular glass on this image, which allows for great clarity, and is suggested with a triple mat. 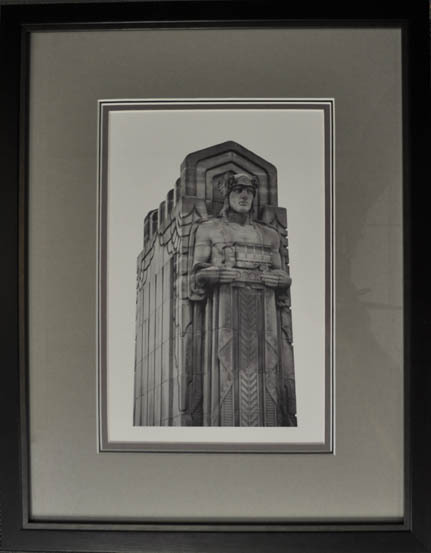 This piece, Image 3, is done with a single white matting. The matting is called “black core”, which reveals a black bevel vs. the traditional white bevel found on most mats. This gives a very defined edge and reiterates some of the lines in the Guardian Print. The frame is simple black metal frame. This is a contemporary and minimal look. This piece is framed with non-glare (or reflection control) glass. Non Glare glass is a great option for rooms with a lot of direct light. Non-glare will cut the glare from any angle for the most optimal viewing experience. This piece, Image 4, has no matting. We simply found a frame that mimicked the style and form of the photograph. This is a wooden industrial frame that has a metal feel. It’s a silver leafed frame with a geometric embossment. The embossments are in relief and accented with an antiquing process to define the rectangular lines. This piece is finished off with non-glare (reflection control) glass. Non-glare glass is a great option for larger images or rooms with a lot of direct lighting. Nonglare glass has a slight frosted look when presented next to the premium glass. Custom Picture Framing has a New Look! Sign Up for Framing Ideas! Subscribe to the Pop Shop's Custom Picture Framing Site and receive notifications by email.